Love and Pizza…and Shakespeare! 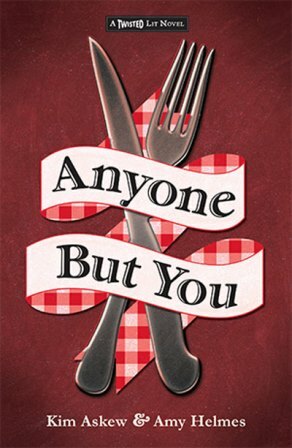 That’s what authors Kim Askew and Amy Helmes have cooked up Chicago-style in ANYONE BUT YOU, book three of their popular Twisted Lit series for young adults. Each of the stand-alone books takes a classic Shakespearean story and spins it into a modern tale that is fresh and fun for today’s teen (or anyone in the mood for an entertaining, light summer read). For Anyone But You, it is the love story of Romeo and Juliet, but the authors do much more than simply transport the star-crossed pair to present day. They also flash back to the 1930s and ’40s to uncover what originally caused the feud between the families and offer a satisfying alternate ending to the original’s tragic conclusion. Best of all, it doesn’t matter if you know the complete Romeo and Juliet story or not. If you do, you’ll have the added fun of seeing the smart ways they reinvent characters and events to parallel the original, but if you don’t, you’ll get a clever, sweet, and altogether charming tale of young love and the power it has to overcome all odds. No one seems to know how the feud between the Caputos and the Montes began but this time their bad blood might be the end of Cap’s, the Italian restaurant run by Gigi’s family. When a fire alarm mysteriously triggers the sprinkler system ruining everyone’s dinner – including the food critic whose review will make or break them – she’s sure it’s the work of the Monte boys whose family runs a rival pizza business just down the street. Thanks to their repeated vandalism, and Cap’s rapidly depleting bank account, things look bleak for the Caputos. After a chance meeting with dreamy Roman Monte during Gigi’s sweet sixteen party propels the two teens into a breathless secret romance, it becomes clear that they’ll have to uncover the past if they ever want a chance to live happily ever after. To do so, it means going back to the 1933 Chicago World’s Fair and figuring out what caused two boyhood best friends to turn their backs on each other. This second story unfolds in alternating chapters as the narrative voice switches back and forth from Gigi Caputo in present day to Nick Monte in the 1930s. Rather than functioning as a traditional subplot, which may not carry as much detail nor have as much significance, Nick’s story is even more compelling than that of the love story. What makes it so effective is that beautiful element of the unknown that keeps the reader fully invested as the puzzle begins to come together. But beware of drawing conclusions too early because there are some surprising twists in the last fifteen pages that are nothing short of heartbreaking. Askew and Helmes create two rich worlds, each with distinctive details that flesh out a realistic portrait of Chicago, yesterday and today, while still keeping the story compact and moving along. They effortlessly weave together Shakespeare’s themes, passions, and desires while reinventing the elements into a satisfying story for today’s young adult. Additional books in the Twisted Lit Series include EXPOSURE (based on Macbeth) and TEMPESTUOUS (based on The Tempest). For more information, go to http://twistedlitbooks.com/.